Above: Wade Boteler in The Green Hornet (Universal, 1939). Red-haired and burly, with a pugnaciously dignified face and a crisply authoritative but pleasant voice that he could easily embellish with a convincing Irish brogue, Wade Boteler spent much of his movie career playing policemen of ranks ranging from patrolman to commissioner; when not portraying a member of the force, he typically played military officers, Western sheriffs, and other characters similarly required to be both respectable and tough. Thus typecast, he worked steadily as a character actor in innumerable feature films; he also played major supporting good guys in four Universal serials, and used the extended screen time these chapterplays gave him to expand his stock “gruff lawman” screen character to distinctive, lively, and even amusing effect. Wade Boteler was born in Santa Ana, California, not long after his family had moved from Missouri. The 1910 federal census has the young Boteler working as a “tool dresser” in a California oil field, but within the next four years he had entered the acting profession and relocated to the East Coast–as shown by his 1914 appearance in a Broadway play and his 1915 New York City marriage certificate. His 1917 draft-registration form lists his occupation as “instructor” at NYC’s American Academy of Dramatic Arts; by 1918 he was living in Texas, where his first son was born (according to the 1920 federal census), and by 1919 he was back in California, where he began his movie career. During the ensuing decade, Boteler played several screen heavies (usually swaggering roughnecks or ruthless businessmen) in silent features for a multiplicity of producers, and in the silent Universal serials Around the World in 18 Days and The Social Buccaneer; however, he also portrayed plenty of upright official types during this period, and by the late 1920s had more or less found his screen niche as a gruff authority figure. 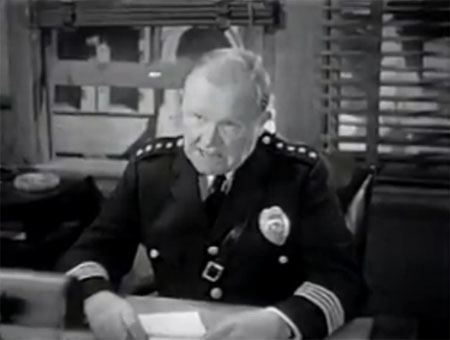 Boteler easily adjusted to the sound era, and continued playing policemen, sea captains, soldiers, prison guards, athletic coaches, and similar types throughout the 1930s, taking parts ranging from bits to sizable character roles at both big studios (Warner Brothers, Fox) and small ones (Columbia, Republic, various independent outfits). He made his first sound serial in 1938–Universal’s cops-and-robbers chapterplay Red Barry; based on a comic strip by Will Gould, this uneven but absorbing outing starred Buster Crabbe as the titular police detective, who was assigned to investigate a series of murders in Chinatown and the theft of valuable savings bonds. 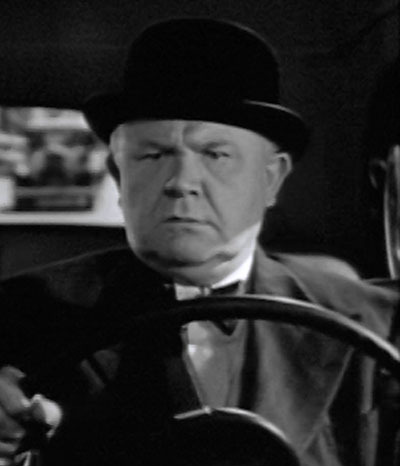 Boteler was cast as Inspector “Scotty” Scott, Barry’s police superior–and, unlike most serial officials, wasn’t relegated to simply sitting behind a desk and giving the hero orders; instead, Boteler’s Scotty frequently participated in shootouts and car chases right alongside Crabbe’s Barry, when not verbally battling an impatient police commissioner who wanted Barry taken off the case. Boteler was easily able to make Scotty seem like a capable and toughly down-to-earth police veteran, and also did an excellent job of handling the character’s more human aspects; he was at once professional, affable, and fatherly in his interactions with Crabbe, coming off as not only the hero’s trustiest aide, but his friend and mentor as well–while his bluntly irascible interactions with the pompous and foolish commissioner lent some excellent character-based humor to the serial. Above: Wade Boteler, Buster Crabbe, and Frances Robinson look for clues in Red Barry (Universal, 1938). 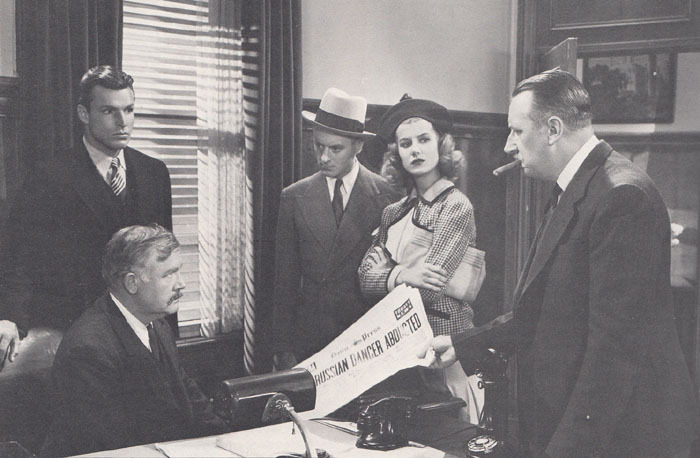 Above: Police commissioner William Gould (far right) badgers an unmoved Wade Boteler and Buster Crabbe about the slow progress of their investigations; Hugh Huntley (as the commissioner’s detective protégé Valentine Vane) and Frances Robinson watch the argument in Red Barry. Buck Rogers (Universal, 1939), a futuristic adventure serial that starred Red Barry’s lead Buster Crabbe, gave Boteler a small but important first-chapter role as Professor Morgan–the scientist who, via radio, instructed trapped aviators Buck Rogers (Crabbe) and Buddy Wade (Jackie Moran) in the use of the suspended-animation gas that could alone save their lives. This “Nirvano” gas, which subsequently preserved Buck and Buddy until they were awakened in the 24th Century, was vital to the serial’s plot, and the grave, quietly urgent way in which Boteler explained its use to the heroes did much to help make the gimmick seem believable. Above: Wade Boteler gives some emergency instructions in the use of Nirvano gas in Buck Rogers (Universal, 1939). Kenneth Harlan is on the far right, Lane Chandler is wearing the military uniform. Boteler’s next serial, the entertaining Green Hornet (Universal, 1939), gave him his best-remembered chapterplay part–that of the Irish-accented ex-policeman Michael Axford, a reporter on the big-city newspaper the Sentinel and the bodyguard of its crusading editor Britt Reid (Gordon Jones). As in the radio show on which Hornet was based, the Axford character was half sidekick and half unwitting antagonist: he loyally seconded Reid in the editor’s campaigns to smash various rackets, but relentlessly tried to track down the masked Green Hornet–supposedly a criminal, but actually a guise assumed by Reid himself to more effectively fight crime. The hot-tempered and blunderingly impulsive Axford was a good deal more incompetent than most of Boteler’s other screen characters, but was highly lovable (and genuinely funny) nonetheless–whether he was eagerly rushing into Reid’s office with crime reports, confronting seemingly respectable racketeers with the aggressiveness of an old-time cop instead of the diplomacy of a journalist, doggedly but futilely trying to corner the Green Hornet, or exasperatedly arguing with Reid’s secretary Miss Case (Anne Nagel) whenever she expressed her admiration for the mysterious Hornet. 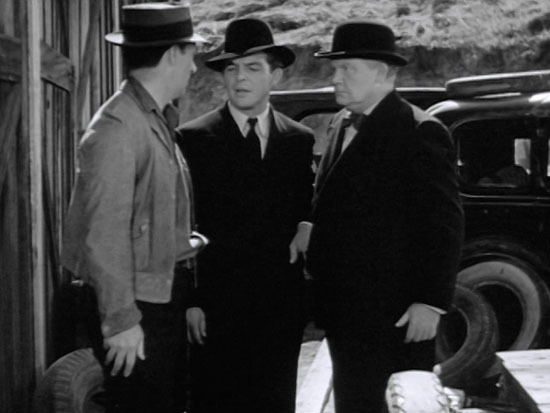 Above: Wade Boteler glowers at shady car-lot owner William Pagan, as Gordon Jones (center) tries to smooth over the situation in The Green Hornet (Universal, 1939). 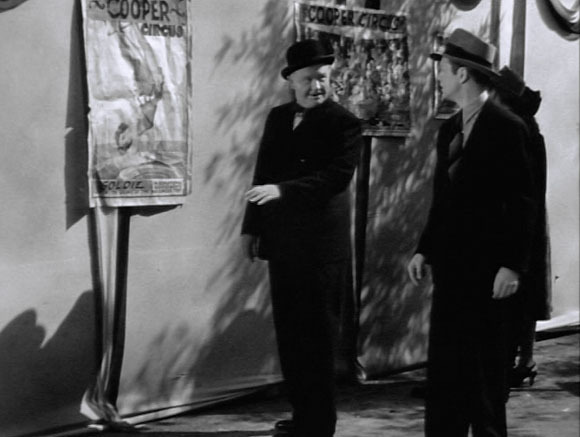 Above: Wade Boteler irks journalistic colleague Phillip Trent by boyishly stopping to admire an enticing circus poster in The Green Hornet. As the 1930s gave way to the 1940s, Boteler remained a very busy feature-film character actor–playing yet more policemen in many crime and mystery pictures for Warners and Fox, and portraying sheriffs and Army officers in several Republic B-westerns. He also worked frequently at Universal, where one of his earlier 1940s assignments was the serial The Green Hornet Strikes Again (Universal, 1940). This enjoyable sequel cast Warren Hull as Britt Reid/the Green Hornet, instead of Gordon Jones, but the irrepressible Mike Axford was again played by Boteler–who, as in the first serial, figured prominently in the action as both a help and a hindrance to the hero, eagerly participating in Reid’s investigations of the city’s racketeers, but obsessively trying to exterminate that “divil,” the Green Hornet–and engaging in plenty of entertaining bickering with Miss Case (Anne Nagel again) and fellow-reporter Lowry (Eddie Acuff). 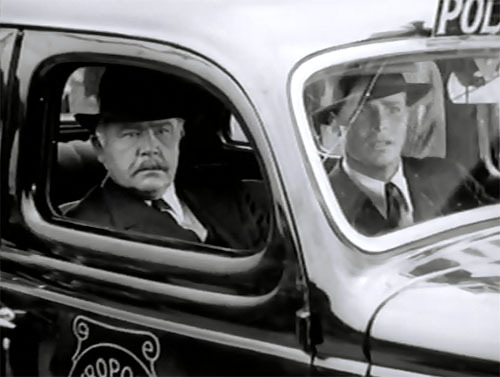 Above: Wade Boteler assures Anne Nagel that his new souped-up car is sure to catch the Hornet in The Green Hornet Strikes Again (Universal, 1940). 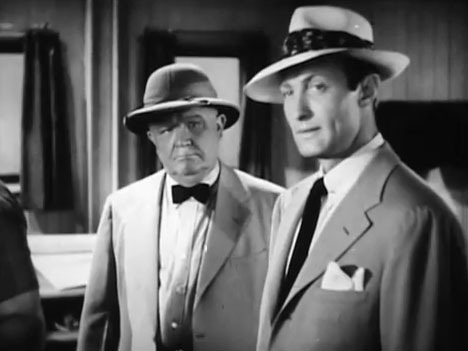 Boteler’s final co-starring serial role was in the pre-war espionage outing Don Winslow of the Navy (Universal, 1941); as Navy Intelligence operative Mike Splendor, Boteler served as a secondary sidekick to Navy commander Winslow (Don Terry), backing up both him and his primary sidekick, Lieutenant Pennington (Walter Sande) in their fights with the ruthless Scorpion spy organization. Boteler used his Axford brogue for the Splendor part, but the Navy character was considerably sharper than the Hornet one; though entertainingly feisty and outspoken, Splendor was also a sober and intelligent investigator. Boteler gave the character a proper combination of boisterousness and responsibility, and also established a good rapport with both Terry and Sande. Above: Wade Boteler warily watches suspicious character John Holland in Don Winslow of the Navy (Universal, 1941). Boteler’s final chapterplay was The Secret Code (Columbia, 1942), a wartime crime serial that starred Paul Kelly as a police lieutenant who got himself dishonorably discharged in order to infiltrate and destroy a Nazi spy ring. Boteler played the supporting role of the stern Police Chief Burns, who presided over the authorities’ efforts to track down the seemingly traitorous hero and his Nazi associates. Boteler stayed behind an office desk throughout Code, but got several chances to gravely supervise enquires, and also got multiple opportunities to react with amusing grouchiness to the lame excuses of detective Clancy Cooper (who was assigned to bring Kelly in, but was secretly helping him). 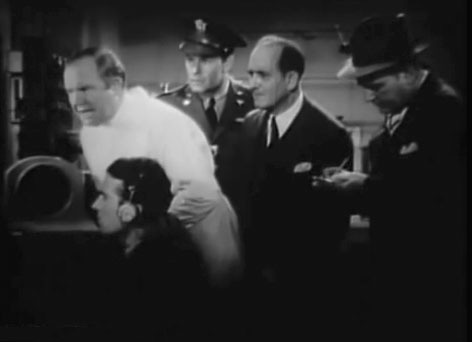 Above: Wade Boteler chews out the off-camera Clancy Cooper for his apparent failure to keep on the trail of Paul Kelly in The Secret Code (Columbia, 1942). 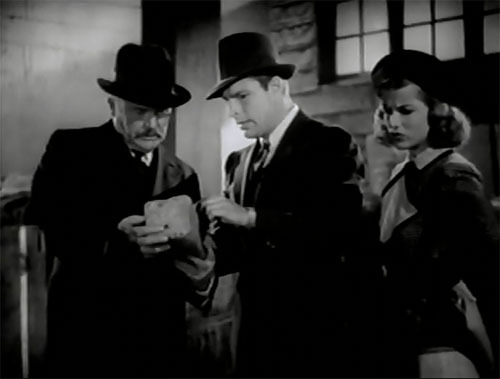 Less than a year after Secret Code’s release, Wade Boteler died of a heart attack in Hollywood; the many films he’d completed before his passing continued to appear in theaters for almost another full year, with the last of them coming out in 1944–the Warner Brothers B-crime film The Last Ride, in which he played one final police chief. Wade Boteler played his prominent chapterplay parts with the same steady skill he brought to his many smaller feature-film roles, handling each of his four serial sidekick characters in admirably balanced style; he made Inspector Scott and Mike Splendor seem like completely capable officials while simultaneously giving them warmly human personalities, and likewise managed to make Michael Axford endearing even while playing his bumbling truculence to the hilt. Whether serious or comic, competent or incompetent, Boteler was always a welcome presence in the serial world. Above: Wade Boteler on patrol with Buster Crabbe in Red Barry (Universal, 1938).